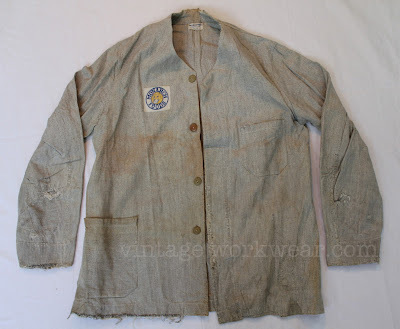 Vintage Janesville Clothing Co. MONARCH FOODS work jacket constructed of twisted yarn convert cloth a.k.a. salt & pepper. Much less common than the standard dark grey version of salt & pepper fabric, this light variation gets its color by emphasizing the lighter natural color threads. Details lead us to date this jacket to the 1940s era, possibly earlier. Part of the VintageWorkwear.com collection. Monarch Foods roots can be traced to Reid-Murdoch Co. a Dubuque, Iowa provisions company founded in 1853 that sold flour, bacon, sugar and other food staples to wagon trains heading west during the 1850s gold rush. Monarch is still doing business today.